On Jan. 25, members of the EttaGrace Black Theatre Company reprised their roles in their third year of presenting The Meeting, a play about a fictitious meeting between Dr. Martin Luther King Jr. and Malcolm X. 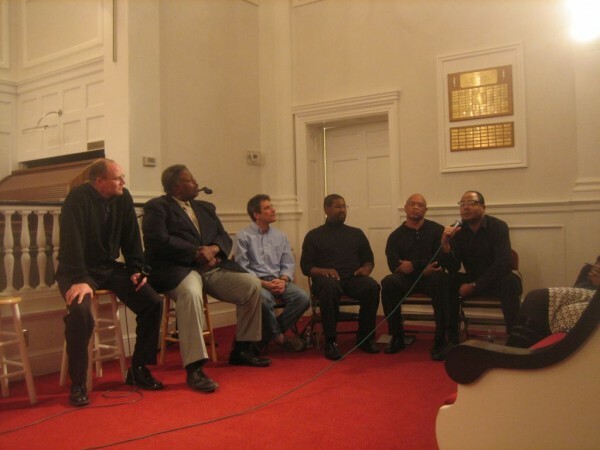 The First Unitarian Church of Salt Lake City hosted the reading of the play as part of Salt Lake Community College’s celebration of Martin Luther King Jr.
After the reading, a panel explored the legacies of King and Malcolm X and the different and opposing ways that King and Malcolm X used to gain freedoms for African-Americans. According to associate professor Josh Gold, Malcolm X came back from Mecca changed. “On the hajj, his pilgrimage, race played no role,” says Gold. While America has come far in the struggle for equality, there is still work to be done. SLCC’s celebration of King will continue with keynote speaker Michele Goodwin at noon on Jan. 28 in the Oak Room on the Taylorsville Redwood Campus in the Student Event Center and the presentation of and panel discussion with the winners of the 2013 Martin Luther King Humanitarian Embracing the Dream Award winners on Jan. 29 at 9 a.m. in the Oak Room.